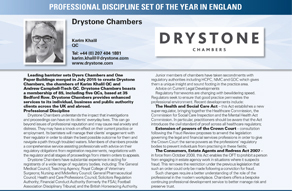 We are delighted to announce that Drystone Chambers have been voted ‘Professional Discipline set of the Year’ by Global Law Experts 2017 Annual Awards. Throughout the year, GLE conduct an extensive nomination and research process, creating a shortlist of candidates in each practice area before consulting their database of 30,000 GLE website users. During this recommendation stage, GLE received responses from business directors, in-house counsel, independent law firm, bar associations and LinkedIn users. Those recommended firms or sets were then judged on client testimonials, case studies, legal rankings and published material in order to ascertain the leaders in each practice area. For more information click on the thumbnail image below.